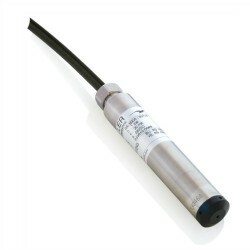 The 36 X W is a high accuracy sensor with analogue 4-20mA / 0-10Vdc or digital RS485 output for submersing into a liquid to measure depth. You can choose either a dual digital/analog output, or single analog or digital output configuration to read hydrostatic pressure. The analog output can be supplied as 2 wire 4-20mA current loop or 3 wire 0-10Vdc output signal. 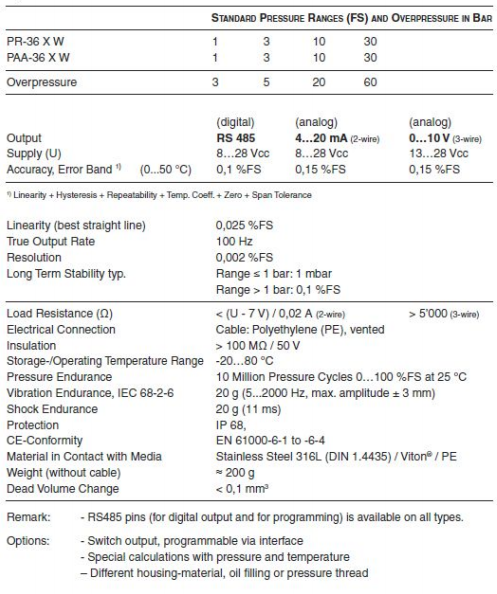 The measurement accuracy of 0.15% for the analog signal, and 0.1% for the digital signal includes a temperature range of 0 to 50°C (32 to 122°F). Using the PC software suite provided, the analogue output of the 36 XW sensor can be re-scaled & re-calibrated to adapt it for a specific liquid level range and maintain precision over a long period of time. The PC software can also be used to live log or display level readings with the computer whilst connected to the 36XW via the optional USB or RS232 serial interface converter. 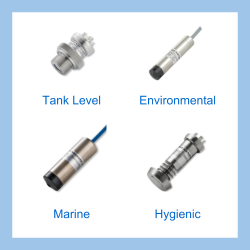 Specifications details for standard versions of the 36 XW submersible digital level sensor. Dimensional drawing for the 36 XW IP68 digital hydrostatic level sensor. 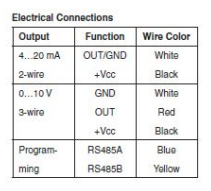 Wiring colour details for connecting power, analogue signals and digital interface. A walk through the setting up of a digital transmitter using the CCS30 software to configure and log readings from the 36 X W level sensor. We are looking for a rangeable sensor which we can hold in stock and install in different height diesel fuel storage tanks to measure the level. We would also like to adjust the scaling of the output for variations in diesel specific gravity to improve level measurement accuracy for seasonal temperature changes and grades of diesel? A standard 1 bar range 36XW can measure diesel level in tanks varying from 1 metre up to 10 metres in height. The output scaling can be adjusted in-situ wihtout removing the sensor from the tank, using the CCS30 software which is included with the RS485 to USB digital converter cable. I need a submersible vented sensor with a max pressure of 0.5 bar with a USB output to use directly connected to a laptop. I am going to use the sensor in a standpipe. Do I need software for my laptop? We would suggest a PR-36 X W with a 1 bar gauge range which is the closest range for measuring up to 0.5 bar. If you plan to use the analog out, you can rescale the 4-20mA output to 0 to 0.5 bar to match the exact range required. The specification suggested below includes PC software for installing on a Windows laptop and a RS485 to USB converter for connecting the sensor to the USB port. We are looking for a re-rangeable submersible liquid level sensor with a range of 60 metres of freshwater and a 4-20mA output to place in a borehole? The 36 xW has a RS485 digital interface for configuration and measurement purposes, along with the analogue 4-20mA output. Using the software the 4mA and 20mA output can be re-ranged to a smaller span. A standard 10 bar range (~100 mH2O) is easily re-ranged to 0-60 metres using the PC software & USB interface kit which provides the connection between the sensor and computer. Send us your enquiry for 36XW Digital Submersible Hydrostatic Level Sensor to get assistance with this product type.